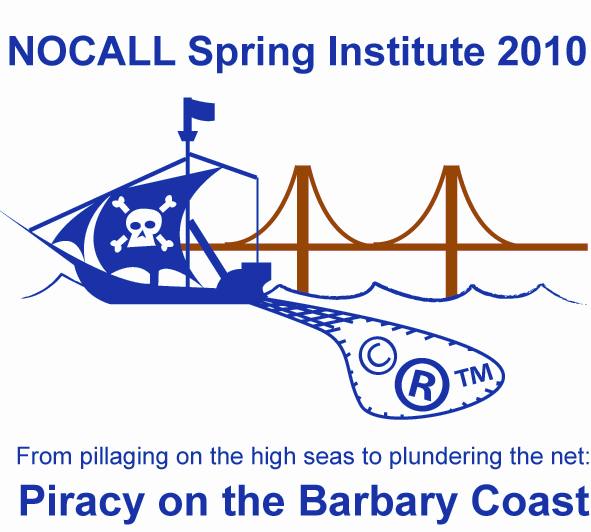 This year NOCALL turns 30 and to celebrate the Spring Institute Committee is pleased to present Piracy on the Barbary Coast: From Pillaging on the High Seas to Plundering on the Net. Today piracy includes not only abduction on the seas but abductions of all sorts, from copyright and trademark infringement to cybersquatting and identity theft. In addition to the substantive programming, we are hosting a Friday night cocktail celebration to mark NOCALL’s Pearl Anniversary in Harry Denton’s Starlight Room at the top of the hotel. Vendors can download a vendor packet here. Download the Vendor insert here. Farella Braun + Martel LLP, Certified Provider #1200 and sponsor of the 2010 NOCALL Spring Institute, certifies that this activity has been approved for MCLE credit by the State Bar of California. 1:30 pm – 3:00 pm Program – Google: Brigand on the Digital High Sea?